for work or pleasure, we aim to make you welcome. We are 5-10 minutes walk from the railway and bus stations and the town centre. Four of our Five bedrooms have en suite showers, toilets and washbasins. Two cosy doubles, at the back of the house one on the ground floor. Two Flexible ( a double and a single bed). rooms both have a superb sea view. One of which is on the ground floor. 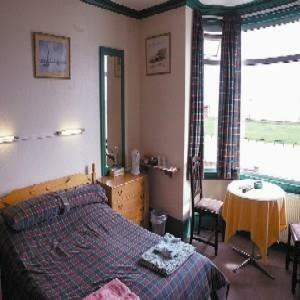 We have one single room with shower and washbasin in the room, seperate private WC facilities, and a sea view. Free wi-fi. TVs in all of the rooms with freeview. We also provide tea and coffee making facilities and biscuits. There is free parking on both sides of the road outside the house.